The Winter Hexagon, also known as the Winter Circle, is a prominent winter asterism formed by seven stars prominent in the winter sky. These are Rigel in Orion, Aldebaran in Taurus, Capella in Auriga, Castor and Pollux in Gemini, Procyon in Canis Minor, and Sirius in Canis Major constellation. Sirius and Procyon are also part of the Winter Triangle, a smaller asterism that these two stars form with Betelgeuse in Orion. The Winter Hexagon can be seen high in the sky between December and March in the northern hemisphere, with a band of the Milky Way running through the centre of the asterism. In southern latitudes, the asterism appears as the “summer hexagon” or “summer circle” and can be extended with Canopus in the southern constellation Carina, the second brightest star in the night sky. The area of the sky within the borders of the Winter Hexagon contains parts of several constellations: Auriga, Canis Major, Canis Minor, Gemini, Monoceros, Orion, Taurus, Lepus and Eridanus. The Winter Circle can be seen from northern latitudes from late December, when it rises in the southeast at around 9 p.m. in the evening. 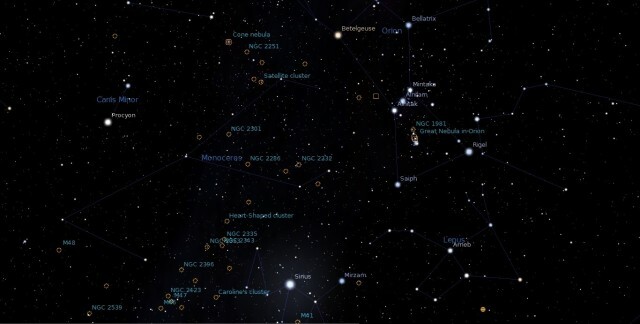 The asterism is highest in the sky around 1 a.m. and makes its way to the southwest by 5 a.m. By late January, it is visible around 7 p.m. and reaches its highest point in the sky around 11 p.m. The Winter Hexagon can be seen in the southern sky early in the evening in late February and early March. The seven stars that form the Winter Hexagon are among the brightest stars in the sky. Sirius is the brightest of all stars, Capella is the 6th brightest star, Rigel and Procyon are the 7th and 8th respectively, Aldebaran is the 14th, Pollux the 17th, and Castor the 24th. Betelgeuse, which isn’t part of the Hexagon but is located near its centre, is the 10th brightest star in the sky. 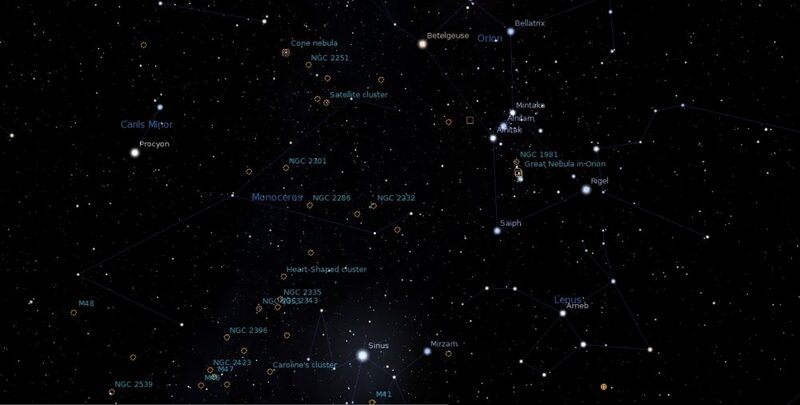 The asterism is easy to find using the stars of Orion constellation. Rigel, marking the right foot of the celestial Hunter, also marks the southwestern corner of the Winter Hexagon. Going left, Sirius, the brightest star in the sky, marks the southernmost tip of the asterism. Still going clockwise, Procyon is easy to spot because it is also part of the Winter Triangle, which it forms with Sirius and Betelgeuse, the star that marks the left shoulder of Orion. Castor and Pollux, two stars that appear almost identical in colour and brightness, can be found by extending a line from Rigel to Betelgeuse, and the bright Capella marks the northern tip of the asterism and lies to the upper right of the celestial twins. Aldebaran is easy to find using the stars of Orion’s Belt, by following the line formed by the three stars in the direction opposite to Sirius. The Winter Hexagon contains several prominent nebulae. The Orion Nebula (M42), the most prominent nebula in the winter sky, is easily visible even without binoculars in clear, dark skies. It is located in Orion’s Sword, just under Orion’s Belt. De Mairan’s Nebula (M43), separated from M42 by a large dust lane, is part of the same molecular cloud. The Horsehead Nebula, one the most famous dark nebulae in the sky, is located in the vicinity and also part of the Orion Molecular Cloud Complex. The Cone Nebula with the Christmas Tree Cluster and the Rosette Nebula with the open cluster NGC 2244, both located in the constellation Monoceros, are also found within the Winter Circle. The Rosette Nebula can be found along the line from Betelgeuse to Procyon, while the Cone Nebula lies just to the north of the same line. The Crab Nebula (M1), a famous supernova remnant in Taurus, forms a triangle with Betelgeuse and Aldebaran, and can be found about two thirds of the way from Betelgeuse to Elnath, Beta Tauri. The Hyades open cluster, whose stars form the V-shape that marks the head of Taurus, the Bull, is found in the same line of sight as Aldebaran. Messier 35, a large open cluster in Gemini, is located roughly halfway between Aldebaran and Castor. The open clusters Messier 36 (Pinwheel Cluster) and Messier 38 (Starfish Cluster) lie within the polygon formed by the bright stars of Auriga constellation, while Messier 37, another prominent open cluster, is found just outside the polygon. Two other famous deep sky objects can be found using the stars of the Winter Hexagon even though they don’t lie within the asterism. Praesepe, also known as Messier 44 or the Beehive Cluster, forms a triangle with Procyon and Pollux. The open cluster is bright, large and can be seen without binoculars on a clear night. 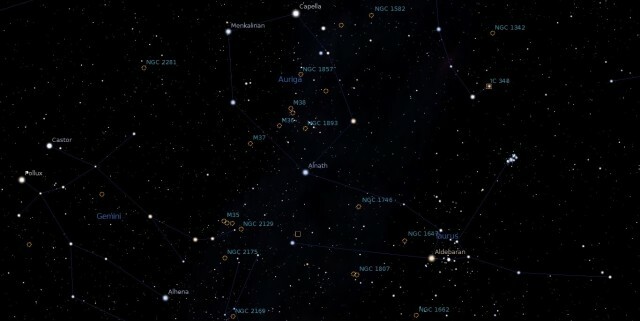 It is one of the nearest open clusters to our solar system. The Pleiades (Messier 45), another nearby open cluster, can be found by extending a line drawn from Sirius to Aldebaran, or by following the line of the stars of Orion’s Belt to the northwest. The cluster is very prominent and easy to spot in clear skies, and does not require binoculars.